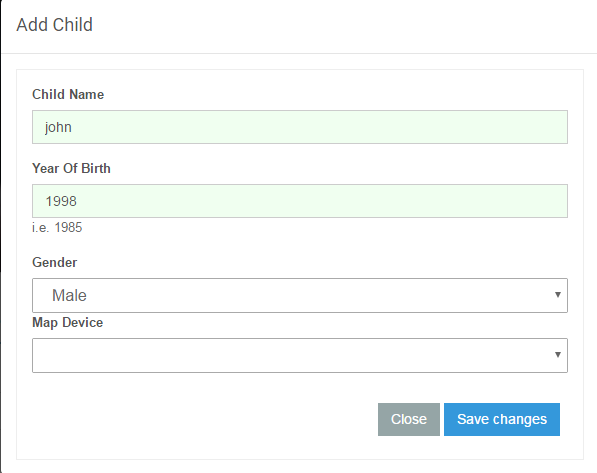 Enter 'Child Name' of your choice, child's 'Year of Birth', 'Gender' and select a 'Device' which you want be linked/mapped with this 'Profile'. 'Map Device' drop down menu will list all your devices that you have registered with SecureTeen during configuration process. It is an optional field. If you do not want any device to link with this 'Profile' right now, you can leave it deselected. You can link a device to any "Child Profile" later by following the instructions at "How to Link a child Profile to a Device". Click the 'Save' button when you are done.